Nice signals on 20 meters made it pretty easy to connect with old friends and new. Enjoyable short evening. Tnx for the contacts. 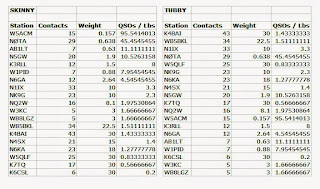 It seems that operating four QSO Parties this past weekend helped my CW skills for May's Sprint. There were even a couple of QSOs on 15 meters early on. Twenty meters was perfect until I’d worked everyone I could hear. Forty meters was way noisy and I appreciate the folks that stuck with me until I copied the exchange. This contest is always fun for me. Hey y'all!! Another great sprint running 1 watt from my K2 again the entire time! I was away from home and missed the first 30 mins. My first contact coming at 9:32 eastern. 20 was good and I stayed there for the first 30 mins. until it started downhill. 40 never was very good at my place and 80 was even worse. I got 13 on 20, 7 on 40, and just 1, K4BAI on 80. I had 4 two bangers, K4BAI, N1IX, W5QLF, and WA8ZBT. I heart N0TA calling CQ on 40 and tried several times but he could just not hear me, the same with WB5BKL on 80. 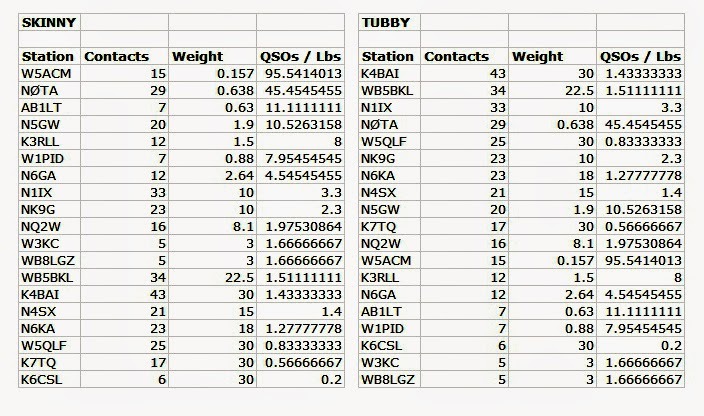 Best DX was K7TQ out there in the great Northwest. Thanks again for those who had to hang in there to copy my 1 watt. I'm looking forward to next month already! A bit slow in Colorado. 15m/2, 20m/15, 40m/12. Thanks for the Q's. ATS-4b, Palm key, ground mounted vertical, and GenLog. This was the first warm evening in Massachusetts after a long nasty winter, so I set up on the porch where I have an end fed wire rigged. A warm evening, working CW, frogs peeping in the background and a glass of wine: I had a most pleasant evening. It seems like everyone was on 20M. While fishing around 40M I hit a Russian station 5,000miles away, so that's another 1,000 miles/watt contact in the log. CW rocks! My rig is a Weber MTR_V2 with an internal touch keyer. For touch pads I stuck 2 small pieces of copper Clad to 2 corners of the box with foam tape. Battery pack is 3 AA size LiFePO4 batteries which is enough for over 5hrs of operating. I love the touch keyer because it adds no size, adds about 1oz of weight, there's nothing to break or bend and the whole radio with key weighs less than most keys. Thanks for putting up with my fist. I'm still getting used to the touch keyer and after that 2nd glass of wine my fist got pretty sloppy. LOL. I was a few minutes late, so I started on 20m. Good conditions. At 02:10Z I moved to 40m. Band was very noisy with severe thunderstorms in the Texas and the Mid-West and also in Western AZ and the Chiriaco Desert of Eastern CA. I also spent the last 20 minutes of the sprint on 80m and found it dead. It was still daylight here in SJV until almost 03:30Z. I might suggest an aid to help track thunderstorms: Blitzertung.org has excellent tracking capability and measurement of severity of lightning storms. Will also show regional as well as worldwide coverage. I was tuning around the band late Monday afternoon and heard someone calling CQ SP. Had to look it up because it’s been so long, I didn’t remember what "SP” meant. I had recently dug out my ATS-4 to shake off the cobwebs so it was natural to plug it in and join in the sprint. Station weight — earbuds: .41 oz; ATS-4: 6.43 oz; Battery (3 cell phone batteries taped together): 2.43 oz; Power Cord: .97 oz, for a total of 10.24 ounces. Oops, forgot the keyer paddle, 2 pounds. Need to work on that for next time. Got in 12 Qs before the dinner bell rang. Good fun! I was using a K1 on an 800 mAh Lipo battery at 2 watts. Nothing heard on 15M. 20M and 40M were a bit noisy but otherwise OK.
K1 at 5 W to a 2-element mini-beam at 25 ft for 10, 15, and 20 meters and an inverted V at 40 ft for 40 m. 14 QSOs on 20 and 2 on 40. Unusually loud QRN on 20...40 was almost intolerable...so much QRN that I never tried to call CQ on 40 thinking I may not be able to hear most answers. We'll see what June brings. Thanks for the QSOs and thanks to organizers. IC756Pro, 5W, TH6DXX, dipole, inverted vee. Started on 15M this week and it was open to CA. 20M was good to NY and New England, to CA, MN, CO, and W6/7 areas. 40M was a bit noisy, but QSOs were possible from NE to MN and CO to CA/AZ with a lot of TX activity. No skip zone as N4SX about 120 miles east of me was loud running only one watt. 80M was also noisy, but had QSOs with stations in NC, GA, and TX. Band totals: 15M: 2. 20M: 18. 40M: 20. 80M: 3. Thanks for all QSOs. By next month I should have my FT1000MP back from repair shop. MTR and Windom OCF. QSOs on 20m only. Best DX NK6A. Thanks all for the QSOs. Got to the party late but made a few quick contacts on 40 meters. IC703 at 5 watts and a 90' doublet fed via vintage Harvey Wells ZMatch. 20m was good to the south es west. I tried the FT817 tonight to be Spartan. At just abt 3lbs its not the featherweight, but its all in one pkg.fer convienence. Went to 40 after 20 mins but no joy there, so went back to 20m fer 2 more. Not a lot of activity heard. Lots of fun. The May 2015 Spartan Sprint was almost as good as March! I had NINE contacts on 20M, FIVE on 40M and ONE on 80M. Band conditions were excellent on 20M. I worked stations from CA to ID to NH to FL – and everything in between. Nice. Conditions on 40M were reasonable, but not as fun as 20M. When I finally went to 80M, the QRN was incredibly bad, but WB5BKL in TX was just fine. The 170 mAh LiPo batteries in the ATS-3a are still a bit “puffy”, but they topped off nicely before the event and held solid for 3W out, for the duration. I did have some issues with the homebrew paddle toward the end, but managed to get by. CU next month! Conditions were down considerably from the SP last month. Worked my neighbor K1QO on four bands. K4BAI, AB9CA, N5GW, WB5BKL and WA8ZBT on two bands. Nice to see Bill, AB1AV and Bert, K6CSL! K3/10 at 5W to 15 and 20M delta loops, a 40M dipole or a 40M extended double Zepp. QSOs on 15, 20 40 and 80M - 16 states total. One QRO QSO not counted. Only one 3-bander (K4BAI). Several signals at less than 5W this time. N4SX at 1W was tough but we made it. Nice to hear several new calls. My thanks to all. Had fun. Wow! 20 meters was where the action was. Did not here a peep on 40 and 80.The signals just kept on coming. Weak signals from the left coast but California was well represented. Quite a few stations running less than 5 watts. Band was getting noisy due to approaching storms from west. I operated from the mountains east of Moscow, ID. Rig was a K2 at 5W to a SOTABEAMS Band Hopper 2 that covers 20 and 40 m. It was a clear evening with temperatures in the mid-50s. 20 m was a bit slow in starting, but it picked up until 0140 Z. Around sundown, 0200 Z, I switched the Band Hopper from 20 to 40 m and made one Q before the bugs got so bad I packed up and headed for home. It was a fun hour. Thanks to all who stopped by.